We finish school fairly early in the day at our house. We’re usually done a little bit after lunch. My kids like to use their afternoon time to finish any independent work, do their reading time, and then play. They enjoy making crafts, playing board games, or coming up with some new imaginative play idea. However, their newest favorite thing is to lounge on the couch while listening to audiobooks. Sometimes they even have a coloring book or a craft project while they listen. It makes for a blissfully quiet house while the baby naps! 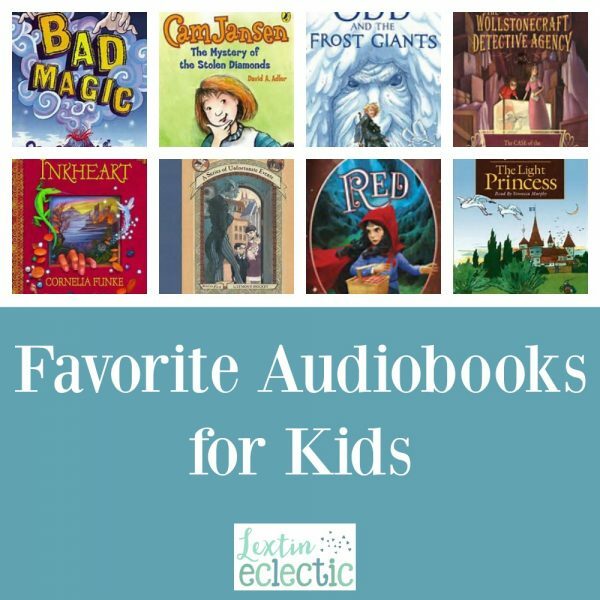 Are your kids hooked on audiobooks yet? Here are some of our current favorite listens to help you get started! Four friends are thrown together when a pair of mysterious ruby red slippers turn up, along with the fashionably mad Cha-Cha Staccato, who bears a frightening resemblance to a certain wicked witch. . . .
Red is not afraid of the big bad wolf. She’s not afraid of anything . . . except magic. But when Red’s granny falls ill, it seems that only magic can save her, and fearless Red is forced to confront her one weakness. As in fake. Cheesy. Unreal. At least, that’s what Clay, who has seen one magic show too many, thinks. When words from his journal appear mysteriously on his school wall as graffiti, he never imagines that magic might be to blame. Can Cam help catch the diamond thief? Cam and her friend Eric are sitting at the mall when the jewelry store is robbed. Cam sees the thief, but the police arrest the wrong person. Now it’s up to Cam to catch the real criminal! Zita is not just any servant—she’s the thirteenth daughter of a king who wanted only sons. When all her royal sisters fall mysteriously ill, the only clue is their strangely worn and tattered shoes. Something sinister is afoot—and Zita must find the source of the enchantment and break the curse, or the twelve princesses will surely dance to their deaths. Mr Fox is so clever that every evening he creeps down into the valley and helps himself to food from the farms. Now the farmers have hatched a plan to BANG-BANG-BANG shoot Mr Fox dead. But, just when they think Mr Fox can’t possibly escape, he makes a fantastic plan of his own . It’s a good thing that Violet Baudelaire has a real knack for inventing things. When misery comes to call, the right invention at the right time can mean everything. The Wollestonecraft Girls embark on their most important case yet – the famed dinosaur fossil hunter Mary Anning is being blackmailed. Her precious dog has been snatched and the kidnappers are demanding that Miss Anning authenticate some fake dinosaur bones up for auction at the British Museum in order to get him back. One cruel night, Meggie’s father reads aloud from a book called INKHEART– and an evil ruler escapes the boundaries of fiction and lands in their living room. Suddenly, Meggie is smack in the middle of the kind of adventure she has only read about in books. When they embark on a mission to locate an ancient book that holds the key to preserving the universe, Nita Callahan and her pal Kit discover an eerie alternate Manhattan, populated with eating helicopters, wolflike creatures, and a dragon. The strange curse placed on the baby princess in this tale prevents the child from having any gravity. The princess must be kept from floating away by a rope that moors her to the ground like a human balloon. Somehow she must find a way to fall in love to break the spell. Odd’s luck has been bad so far. He lost his father on a Viking expedition, his foot was crushed beneath a tree, and the winter seems to be going on forever. But when Odd flees to the woods and releases a trapped bear, his luck begins to change. You can also find other audiobook recommendations and great book lists right here!